The subway was the easiest I’ve used in any country, including America. English is one of Singapore’s official languages, which makes visiting an easy affair for Americans. You’d think you were riding the subway in Boston or New York City if not for the signs clearly indicating that no durian is allowed onboard. Durian, for those who are unaware, is a fruit that looks like a giant round seedpod with hundreds of spikes covering its skin; crack open the rind and you’ll find pale yellow flesh with a very distinctive odor. Some say it’s reminiscent of sweaty feet after a long day of hiking. This smell is the reason durian is not allowed on the subway despite the fact that it’s the national fruit of Singapore. Our hostel was located right off the subway station in the heart of Chinatown. It was the cheapest place we could find with semi-decent reviews, and with a name like “5 Foot Way” it seemed appropriate lodging for us! When we saw our shoebox room with a bunk bed and little else, we knew it would be perfect for our four-day stay on this tiny island country. Katie, having harbored a sensitive stomach for the past few weeks, was anxious about eating, but everything we’d read about Singapore said it was unlike any other place in Southeast Asia. Where Indonesia seemed lacking in standards, Singapore was more regulated than a slaughterhouse on inspection day. (OK, maybe not the best image to conjure, but you get my point.) Water, for instance, is clean to drink straight from the faucet, and restaurants get health inspections with A through F grades, just like in the U.S. Unlike Thailand and Cambodia, traffic doesn’t choke the streets with the chaos of a swirling tornado. On the contrary, traffic is a trickle, which is impressive seeing as the size of the main island is 278 square miles with a population of 5.6 million people! “How could this be?” you may be wondering. The answer is rules, rules, rules. You’re not allowed to own a car without paying a $75,000 vehicle registration fee, and that’s before the cost of the car itself, which is marked up considerably in the Singapore market. As you can imagine, the answer to why there’s no traffic is quite simple – no one owns a car. And when you think about it, there’s not much point when you have an affordable and efficient subway system and taxis that take you out of the city whenever you want. Then there is the infamous chewing gum ban. Singapore outlawed chewing gum in 1992 with the exception of medically licensed gum, like Nicorette. Why, you ask? Isn’t it obvious? Because chewing gum is messy. We’ve all seen sidewalks littered with black fossilized gum that will never be unstuck. It causes maintenance problems and sanitation problems, and Singapore has no time for such nonsense. So they outlawed gum. Problem solved! Singapore is known as a semi-authoritarian regime with strict guidelines that can be viewed as very helpful on one hand, and extremely constricting on the other. But we’ll dive more into that later. First, let’s talk about the food…. OK, that was awful, but I can’t deny that Singapore’s food had me waxing poetic every day of our visit. This was discovered during our first evening in Singapore when we ventured out to find dinner at “Food Street,” which was a quick two minute walk from our hostel’s front door. Wary of Katie’s stomach woes, we ate a vegetarian meal at a restaurant run by a Buddhist couple. The elderly owner was a gruff man, but we liked him. We both prefer gruff and direct over wishy-washy and confusing. He grunted at us when we ordered and brought our plates of food with surprising efficiency. The vegetarian dishes were very tasty and didn’t turn Katie’s tummy. To improve matters, we purchased some honey-lemon water for the road to add more sustenance to her diet. The next morning we had the only meal we didn’t enjoy while in Singapore: our free breakfast. 5 Foot Way offered a continental breakfast of toast and stale cereal every morning. When you’re on the road, counting pennies on the daily, you shove these meals down your gullet with a mixture of disappointment and gratitude. That morning we left our hostel to meet a local gentleman by the name of Benji. He was of Chinese descent, born and raised in Singapore, and he offered a free walking tour of Chinatown. When Benji was a boy Chinatown was a giant marketplace full of Chinese immigrants who lived above their merchant stalls in meager wooden buildings. Whole families would squeeze into small “rooms” partitioned off by nothing more than a curtain. No one owned furniture because the floor was their bed. At night Benji’s family would lay out mats, side-by-side, and fall asleep next to one another. Ten families shared a floor with one kitchen and one bathroom, and each day the mothers were assigned a couple of hours to use the kitchen in order to cook for their families and do laundry. Being Singapore, it was extremely hot most of the time. There was no air conditioning in the building, but his family had one fan they ran all day to keep it cool. Benji could still recall the discomfort he’d feel at night, lying in the stifling heat, his thin mat resting upon the wooden floor that creaked and bounced beneath each person’s step. It was an uncomfortable and cramped existence. In the mid 1980s the Singapore government took over Chinatown and forced everyone to move into subsidized housing. There was fear and trepidation surrounding the relocation. How could there not be when your home was being taken from you? But for Benji and his family, when they walked through their new front door, it was like their prayers had been answered. They received their own apartment with actual rooms, and beds, and their own bathroom and kitchen. Throughout his life he’d never experienced having walls before, and spent the first hour just touching them. By American standards his family’s apartment was extremely small – a 2 bedroom flat for a family of 6 – but that didn’t matter in the least to his family. It was a miracle just to have a space of their own. I loved hearing Benji’s personal impressions of this time in his life, and I was grateful to him for sharing them. As we traveled through Chinatown that day, it was a place transformed from Benji’s childhood memories. No longer were the buildings crumbling and cramped. Instead, it was a vibrant marketplace filled with color and commerce. Each day and night, whenever we walked out our front door and through Chinatown I’d think to myself, “This is the Chinatown westerner’s dream of,” with glowing lanterns swaying above, vibrant fabrics flowing from the stalls, friendly vendors coaxing you in, and the sweet scent of a delicious meal just around the corner. But was this a good thing? A westerner’s dream of Chinatown… That statement alone makes it feel inauthentic, like a manufactured cultural enclave created for my enjoyment, or tourists like me. Whether good or bad, I can’t deny that it seduced me into shopping, and I found myself actually enjoying it, which is saying a lot! Our time with Benji was so interesting we decided to do a second walking tour with him the next day, this time through Little India. We learned that in the early 1800s a man named Raffles made Singapore into a successful spice trading port. Due to this, there was a sudden demand for migrant workers. Many Indians came to fill the need, then Chinese and Malay laborers. These communities initially separated upon arrival in their new world. The Indian immigrants originally lived in what is currently Chinatown, but when there was a large influx of Chinese workers they moved their cattle herds north to what became known as Little India. It’s for this reason that a large Hindu temple still remains in the heart of Chinatown. I loved walking through each district with Benji and learning more about what makes the Chinese and Indian people of Singapore uniquely Singaporean. As it turns out, the answer in both cases is they’ve become more progressive and less old fashioned. That said, their culture remains strong, with Buddhist and Hindu temples receiving offerings daily and traditional clothing being warn for every special occasion. Singapore’s history of trade and immigration has created something else to admire: a cross-section of delicious Asian cuisines and fusions. On both days Benji revealed to us various culinary delights, including Singapore chicken rice and Indian pancakes with curry. Both were extremely affordable and mouth-wateringly good. According to Benji, chicken rice is a signature Singaporean dish, and we quickly became addicted to this simple, yet tasty, meal. The secret is the rice is cooked in fresh chicken broth, which makes the flavors blend together with each harmonious bite. We ended up visiting Maxwell Road every day for chicken rice and my other obsession: milk tea on ice. Yes ma’am, I was in heaven. One day we took a taxi out to the Singapore Zoo which is located on the northern half of the island. It’s widely known as a good quality zoo that uses natural boundaries and boasts having no cages or enclosures. We found that to be partially true. Some animals were behind glass barriers while others were free to roam away from visitors, mainly primate species like orangutans, for instance, who had miles of rope connecting them to groves of trees outside of their central area. We saw them swinging above us as we walked the zoo grounds. There was also a large tropical rainforest that was netted off above the forest canopy. It housed a multitude of animals, including birds, flying foxes, sloths, and lemurs that would walk right up to you (no I didn’t touch one, though I was tempted!). The day was hot, of course, but we enjoyed departing the city limits and visiting the animals. When the sun sets each day in Singapore the heat doesn’t so much lessen as become more manageable. It’s for this reason the streets came alive with people, the night invigorating rather then sedated. I threw on my new dress and hit the streets with Katie each night, the temperature comfortable as though I were standing in a heated room. We strolled along Marina Bay enjoying the I Light exhibit, wondered at the pyrotechnic water show, gazed at the giant Lotus Flower building and tried to follow the remote control planes with glowing wings flying in the night sky. We visited Gardens by the Bay, a new outdoor botanical wonderland designed to illuminate the beauty of melding city and nature together. 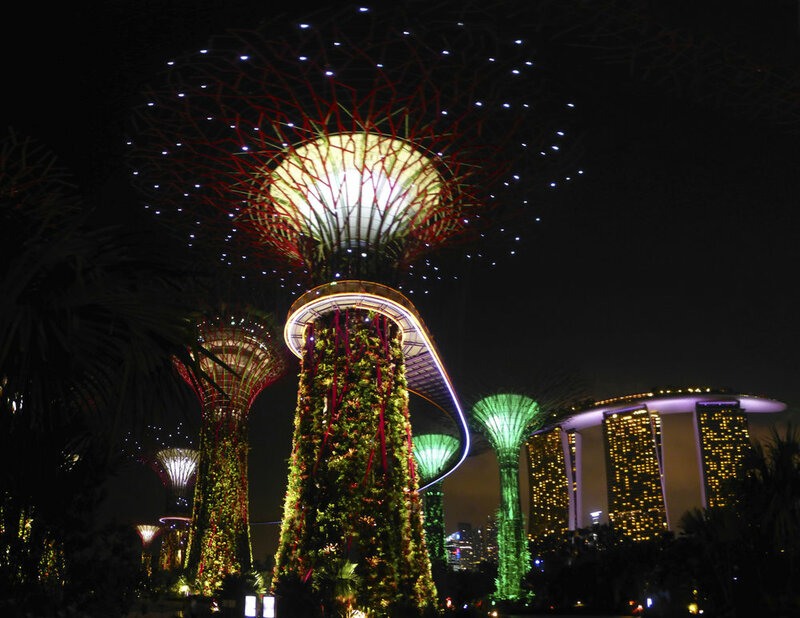 Colossal “super trees” glowed above us, their colorful lights fading and flashing in time to music. Katie and I laid on our backs staring up, like insects on a fantastical forest floor. I’d never felt more like I’d stepped into the time machine and been dropped off somewhere in the future. Singapore felt like a I’d entered an episode of Star Trek where everything felt like it worked well, looked beautiful, and made me feel hopeful. But was it an illusion? Was this a Star Trek episode where you arrive on a planet that seems like utopia only to discover an underlying seediness? There were moments that felt that way in Singapore. For instance, when we toured Little India Benji told us about the recent riots in December. Migrant workers come to Little India on Sunday to do their shopping, buy clothes, have a drink. One day an accident occurred – a bus struck and killed someone. People rioted, turning over the bus and then police cars. Afterward the police determined drunkenness had spurred the riot. As a result, they permanently deported some of the workers and placed a ban on drinking alcohol for the entire street. Benji said the Singapore government doesn’t wait when things go wrong – they take immediate action. None of this struck me as seedy, it’s meant to protect people, after all, but it’s an example of the immediate power the government holds. One can’t deny that crime is low. Living conditions are improved. The bay, once filled with pollution, is now clean and beautified. Tourism is booming. Singapore’s rules and governing style may be strict but it’s all out in the open. It’s a democratic society, but It’s no secret the government has a 75% ruling party that basically run the country continuously without change in leadership. But maybe no one feels the need for a change? It’s hard to know. According to Benji, protests are illegal in Singapore. Despite my misgivings about some aspects of its governance, I can’t deny that Singapore struck me as a country that works well. I just hope everyone feels that way, not just a vagabond tourist, like myself. All-in-all we adored our time in Singapore. It was unlike anywhere else we visited on our trip. There was a constant sense of wonder and excitement in the air, as though the past and present were plugged into one another, energizing the tiny island nation into the future faster than anywhere else. Though the neighborhoods were distinct, I never got the sense that people are segregated. It felt like a natural cohabitation of cultures. Singapore’s robust history led to rapid change, and in its wake breadcrumbs of tradition were left behind, threading a connection between communities that I’d never seen before. When you can step out of a Hindu temple and walk into a Buddhist one on the next street over, it’s hard not to feel the beauty of this unique evolution of culture and heritage.